When it comes to baby gear, I like to find pieces that are extremely functional, modern, and simple. 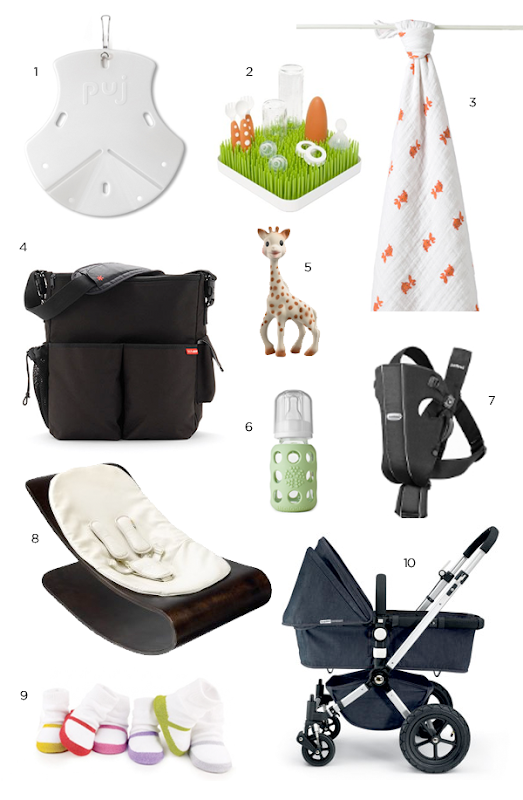 Here are our top ten favorite modern baby gear that we adore. 1. Puj Tub : This portable tub is incredible -- it folds into a kitchen sink fitting tub with ease and when you are finished it and can be stored nearly anywhere! I am amazed at its convenience and smart design. If you are unfamiliar with this, learn more about it here. 2. Boon Drying Rack : I love the shorter profile of this grass inspired drying rack and it is easy to dry a variety of things all at once. 3. Aden + Anais Wraps : These cozy muslin swaddlers are perfect to snuggle the baby up tight so they will sleep better. I look forward to trying the sleep sacks too, although I've never tried them, have you? 4. Skip Hop Bag : We got this bag when we had our first daughter and love the quick ability to snap it to the stroller and the pockets are incredibly handy. Bonus, my husband doesn't mind carrying it at all. 5. Sophie the Giraffe : I picked up this classic while in France and it is a family favorite. It is easily found in many places, and I have seen it become a baby shower gift of choice. 6. Lifefactory Glass Baby Bottle : I really like how these are made of glass because they have an old-school yet also very fresh and modern feel, they are super gorgeous and I can't wait to use them more. 7.BABYBJÖRN : We have loved this carrier with both of our girls, it is super easy to get in and out of, and is one of our staples. I've also found this easier to have the husband wear, instead of a wrap. 8. Bloom Coco Stylewood Baby Bouncer : This bouncer is amazing and seriously looks like a work of art! 9. MaryJane Socks : Although not necessarily gear -- I have found it difficult to find newborn shoes that stay on, so sock-shoes are the perfect alternative. We get compliments on these type of socks constantly. 10. Bugaboo Stroller : We received this as a gift with our first daughter and it has been outstanding -- it has multiple uses, and the bassinet can be used instead of a pack-n-play (when they are small) while traveling, which we recently used. We have never needed another stroller. What about you? What are your favorite baby gear must-haves? my new sister in law loves the heat-sensing spoons i got her - now she doesn't have to eat any gross pureed turkey to test if it's too hot! Swaddlers with velcro are the bomb. We used the Anais ones at first but as baby gets bigger he/she can wriggle out of it, we found. We used kiddapotamus swaddle me and they worked wonders. Loving this post! #9 the Mary Jane socks are my favorite. They are simply adorable!! PS. Hope you're having a great day! Love those maryjanes. My bestfriend is expecting a little girl in Feb and this would be a great little gift for Poppy. Great roundup! The Puj, btw, dries quickly and is super portable, making it fairly easy to take on travel. After all, it's hard to find hotels and hosts' homes equipped with baby tubs. Love all of these - especially the Aiden and Anais wraps. They look so sweet and pretty in those first infant portraits. The only one I'm not a fan of is Sophie. I ordered one after seeing her everywhere and then was disappointed by how rubbery she was. It's basically a doggy chew toy - complete with squeaker. the boot -- Ooh I will have to try those out! Anonymous -- I can see what you mean about the giraffe, although our daughters seem to really like it, but maybe I should also look into toys at the pet store haha. We love sleep sacks! We had a light one by Aiden and Anais for warmer temps, but we really love the one we have by Swaddle Designs that is so soft and fuzzy. Our little guy loves it so much he sleeps with it like a blanky now that he has outgrown it. They are great for colder temps too. We use so many of the same things...sophie, the dry rack, the stroller (ours is uppababy but its essentially the same design). Here is my list of newborn life savers.